There was plenty of fun and laughs shared at the fourth edition of the Community Cup on Sunday 24 February. Spectators were treated to a round-robin style competition at Victory Park, which featured teams comprised of members from the indigenous, and multicultural communities and members from Victoria Police. 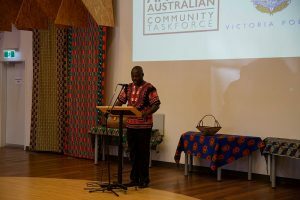 Mr Charles Orguntade, Chair of Goulburn Valley’s African Australian Community Taskforce addressed the official Taskforce launch, held on Thursday 24 January 2018 at St Paul’s African House in Shepparton. 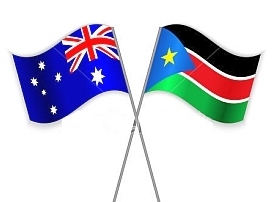 The needs and the aims of the African-Australian Community Taskforce are outlined. 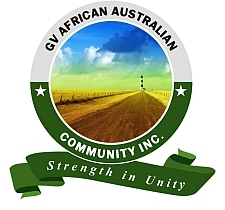 The Goulburn Valley’s African community leaders have partnered with Victoria Police in launching an African Australian Community Taskforce. 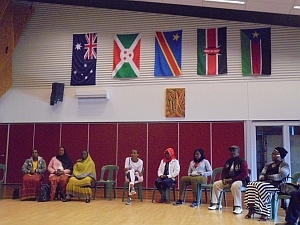 The official launch, held on Thursday 24 January 2018 at St Paul’s African House in Shepparton, saw about 40 people from many local organisations gather to support the launch of the African-Australian Community Taskforce.